Paul McCartney Judges Miming Contest (Ready Steady Go). Peter Croft, with additional presenters David Gell and Michael Aldred. was soon replaced by Manfred Mann's distinctive '5-4-3-2-1'. 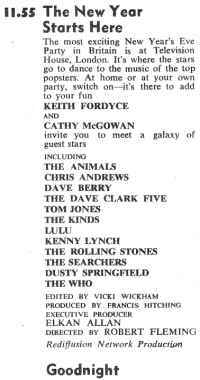 In 1964 it moved to a 50 minute slot which began at 6:08 p.m.
off-the-cuff interviews with the artists usually carried out by Michael Aldred or Gay Singleton. Dave Clark of The Dave Clark Five who acquired them in the Eighties. --Billy Fury - "In Summer" and "Somebody Else�s Girl"
--Brian Poole and The Tremeloes - "Twist And South" & "Do You Love Me"
--Rolling Stones (1st appearance) - "Come On"
--Cilla Black (her TV debut) - probably "Love of the Loved"
- mimed 'Twist and Shout', 'I'll Get You' and 'She Loves You'. aired. Date above is the taping date. --Rolling Stones - "I Wanna Be Your Man"
--The Rolling Stones - "I Wanna Be Your Man"
--Georgie Fame - "Do The Dog"
--The Kinks - "Long Tall Sally"
--Keith Fordyce interviews one or more of the Stones. That" & "Can't Buy Me Love"
drive-in movies, his lack of privacy, his favorite film stars, etc. by the Beatles - "Can't Buy Me Love"
--The Beatles examine artwork sent in by fans as record of "This Boy"
having songs at #1, #2, #3 & #4 in the U.S. charts. --The Animals - "Baby, Let Me Take You Home"
--The Rolling Stones - "Not Fade Away"
--The Rolling Stones - "I Just Wanna Make Love To You"
--Rolling Stones (taped 8-Apr-64) - "Walking The Dog," "Not Fade Away,"
--The Rolling Stones - "Mona," "Route 66" and "Not Fade Away"
--Billy Fury - "I Will" and "Nothin' Shakin' (but the Leaves On The Trees)"
(these 2 songs were on a single released 14 April 1964 UK) ("I Will"
--The Yardbirds "I Wish You Would"
--Rolling Stones - "It's All Over Now" and "Good Times Bad Times"
--Keith Fordyce interviews Mic Jagger, BW and BJ. Note: This date, 3Jul64, was not on the RSG! list. --Rolling Stones - "It's All Over Now"
--Keith Fordyce interviews BW and BJ. --The Rolling Stones - "It's All Over Now"
Guest hosts: Brian Jones & BW. --Gary and the Pacemakers - "Why Oh Why Oh Why" and "My Babe"
circa 1964 - Rolling Stones - "Around and Around"
29-Oct-65 UK) and "Heat Wave"
Rooster" & "Around And Around"
--The Zephyrs - "What Am I Gonna Do"
--Marvin Gaye - "How Sweet It Is" & "Can I Get A Witness"
--Beatles (3rd RSG! appearance)- "I Feel Fine," "She's A Woman,"
"Baby's In Black" & "Kansas City/Hey Hey Hey Hey"
--Kim Weston - "A Little More Love"
on Rediffusion's 'Ready Steady Go'. 'Kansas City/Hey Hey Hey Hey!'. --The Plebs - "I'm Gonna Leave You"
--The Searchers - "This Feeling Inside"
"The New Year Starts Here"
demonstrates a new dancing style. --Kenny Lynch - "On My Own Two Feet"
--Rufus Thomas - "Walkin' the Dog" and "Jump Back, Baby, Jump Back"
was a Saturday, whereas 'Ready Steady Go' aired Fridays. --Donovan - "Talking Donovan Blues"
--Donovan - "Talking Pop Star Blues"
--Crispian St. Peters - "At This Moment"
--Georgie Fame - "Yeh Yeh" (charted 17Dec64) and "Monkeying Around"
--The Rolling Stones - "The Last Time"
--The Rolling Stones - "Play With Fire"
-- Rolling Stones - "I�m Moving On"
--Opening medley: "Baby Love" (Supremes); "You Really Got a Hold on Me"
--Smokey Robinson and The Miracles - "Ooh Baby Baby" and "Shop Around"
--Dusty Springfield and Martha Reeves - "Wishin' and Hopin"
--The Temptations - "It's Growing" & "My Girl"
--The Supremes - "Shake," "Stop! In the Name of Love" & "Baby Love"
--Stevie Wonder - "Kiss Me Baby"
--Dusty Springfield - "Can't Hear You (No More)"
Format change: In April 1965 the series switched to live performances. temporary name change to "READY STEADY GOES LIVE." --The Artwoods - "Sweet Mary"
--Manfred Mann - "With God On Our Side"
--Rolling Stones - "I'm Alright" and "The Last Time"
--The Who - "Anyway, Anyhow, Anywhere"
--Rolling Stones - "The Last Time" and "Play With Fire"
--Simon & Garfunkel - "I Am A Rock"
--The Animals - "Talkin' About You" & "Let The Good Times Roll"
--The Rolling Stones - "Mercy Mercy," "Cry To Me" and "Satisfaction"
--The Who - "My Generation" and "Dancing In The Street"
Goin')," "That's How Strong My Love Is" and "Satisfaction"
miming to "I Got You Babe." --Rolling Stones - "Cry To Me," "She Said Yeah," "Get Off Of My Cloud"
--The Who - "My Generation"
--The Who - "Shout And Shimmy"
--The Rolling Stones - "Satisfaction," "Get Off Of My Cloud"
--The Animals - "Maudie" and "Inside Looking Out"
--David Bowie and the Buzz - "Can't Help Thinking About Me"
--The Who - "Barbara Ann" and "Substitute"
--The Who - "My Generation" and "Substitute"
--The Hollies - "Bus Stop"
--The Troggs - "A Girl Like You"
--The Who - "A Legal Matter" and "I'm A Boy"
--The Who - "I'm A Boy" "Heat Wave"
--Otis Redding - "Satisfaction," "My Girl" and "Respect"
--Eric Burdon - "Hold on I'm Coming"
--Otis Redding - "Pain in My Heart" and "I Can't Turn You Loose"
--Otis Redding, Eric Burton, Chris Farlow - "Shake" and "Land of 1000 Dances"
Note: Taped 4th October 1966: UK TV (ARTV) 'Ready, Steady, Go - Live! ', Wembley. --The Who mime to Cliff Richard's "Summer Holiday"
--Cat Stevens - "I Love My Dog"
--Kim Fowley - "They're Coming To Take Me Away"
--Marc Bolan - "Hippy Gumbo"
studio version of) and "I'm A Boy"